Sculptor Rebecca Ackroyd could be described as a millennial Rosemarie Trockel, discovering disparate materials with considered ease and strength of purpose. From plaster bandage to welded rebar and from cast wax to silk and tulle, these are a few of the materials that Ackroyd employs in her artistic practice that has an underlying feminine elegance delivered with a prickly, tough attitude. At its heart, Ackroyd’s oeuvre centres around a hands-on, roll-up-your-sleeves, materials-focused approach to artmaking that is intimate and bodily. Currently, her work can be seen in the United Kingdom at her solo exhibition at OUTPOST in Norwich (on until 16th April) and a group show curated by George Vasey and entitled These Rotten Words at Chapter in Cardiff, Wales (on until 11th June). 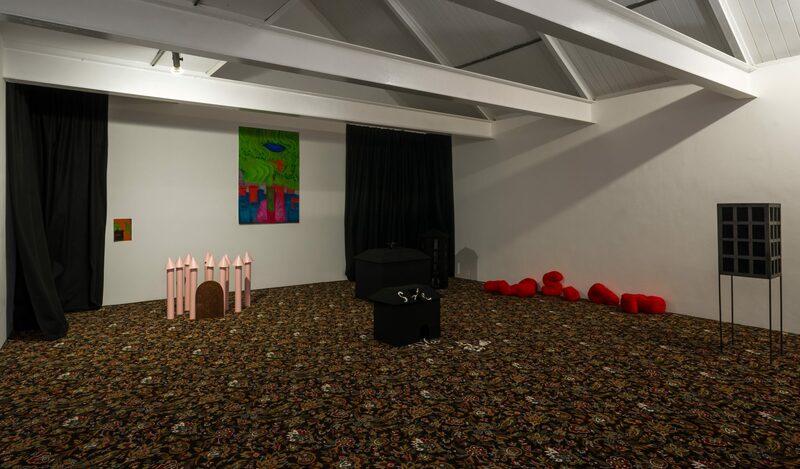 You are currently showing a brave new body of work at your solo show at OUTPOST, combining sculpture, photography and drawings all displayed on a pub carpet in dim lighting and installed in an enclosed space draped with dark felt curtains. The show is entitled ‘House Fire’ and feels very personal and autobiographical with many links to your family and your childhood home. How did you approach this show in an artist-run space far away from the environs of the London art world? The opportunity to show at a space like Outpost has been really important to the development of this body of work, as they gave me complete freedom to make the show however I wanted. I felt that away from London I could really test these new ideas and see how I could push the work into more personal territory. The show as a whole feels much more vulnerable and maybe a bit nervous, or maybe that’s just how I feel about it; it’s more revealing than anything I’ve done before. The OUTPOST show feels very experiential and moody. The lighting is so dim that you must get very close to the drawings on the wall and bend down to discover the subtle details of the floor-based sculptures -- like the dripping wax and the back-lit window in the shape of witchy eyes. Is this important to the conceptual framework of the show? Yeah, it was really important. I wanted the show to feel a bit like the back room of a pub you stumble across and have to wait for your eyes to adjust to the light and have a sense of familiarity. 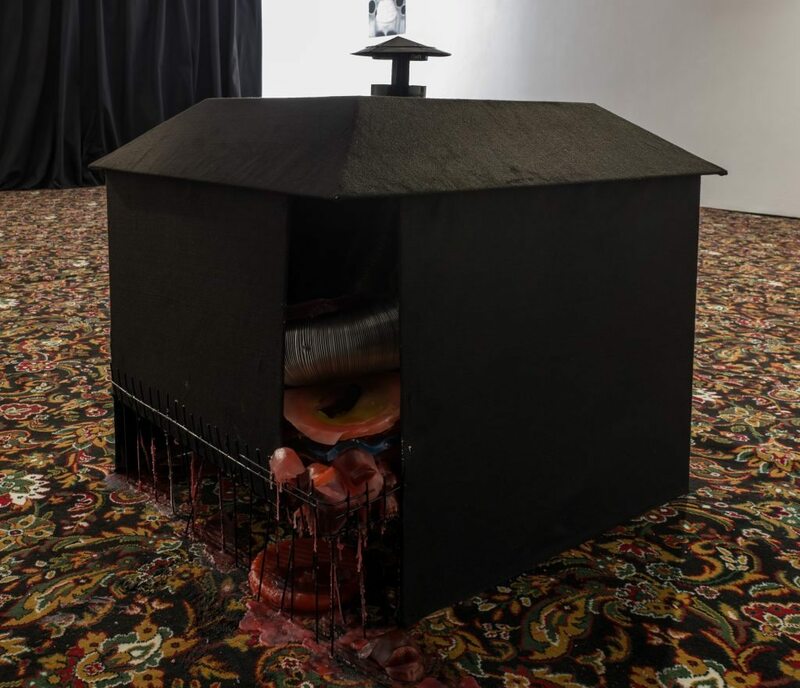 I wanted the sculptures to almost become shadows or voids on the carpet and for everything to absorb light and emerge gradually. I thought about spotlighting the drawings but I felt that it turned them into ‘art’ too much, and I liked the idea of having the densely worked images that peer through the darkness and invite a closer encounter. 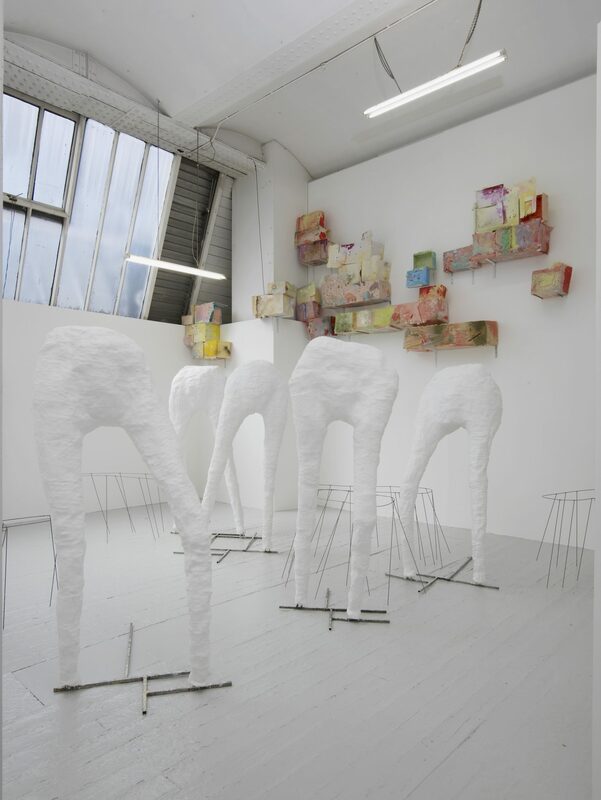 Since your degree show at the Royal Academy Schools in 2015, you have made several figurative sculptures using your signature plaster bandage and chicken wire process. They started out as stand-alone, two-metre-tall, pearly white legs, adopting cheeky stances and grouped together as if standing around at a Hole concert. Since then, they have changed colour – from a dirty beige at the Kinman Gallery show you co-curated in 2016 to an industrial grey at the group show at the Sara Zanin Gallery in Rome in 2017. They have also increased in scale and become part of the fabric of the exhibition space, attached to the wall and incorporating air conditioning ducts and window vents. Has the thinking behind these sculptures changed since 2015? And will this series be something that you continue to reprise in the future? I like the idea of having a material process that allows the construction of large-scale architectural works that are made quickly and that have an urgency. I see these pieces in a similar way to the process of drawing and feel they retain some of that energy and immediacy which is also important in how they are ‘active’ in a space. They have changed from being the evocation of a confrontation or an attitude through a stance or posture to providing an architecture within a space. I want them to suggest the innards of a building and have an echo of former use, which is implied by the air vents I insert in them. I’m still interested in developing them but for the Outpost show I felt that the drawings inhabited the figurative space in the work in a similar way to these sculptures. The current group show at Chapter in Cardiff entitled ‘These Rotten Words’ ‘embraces language that is more contingent and intimate’. What are you showing there, and how do you see the intimacy of your own sculptural language? 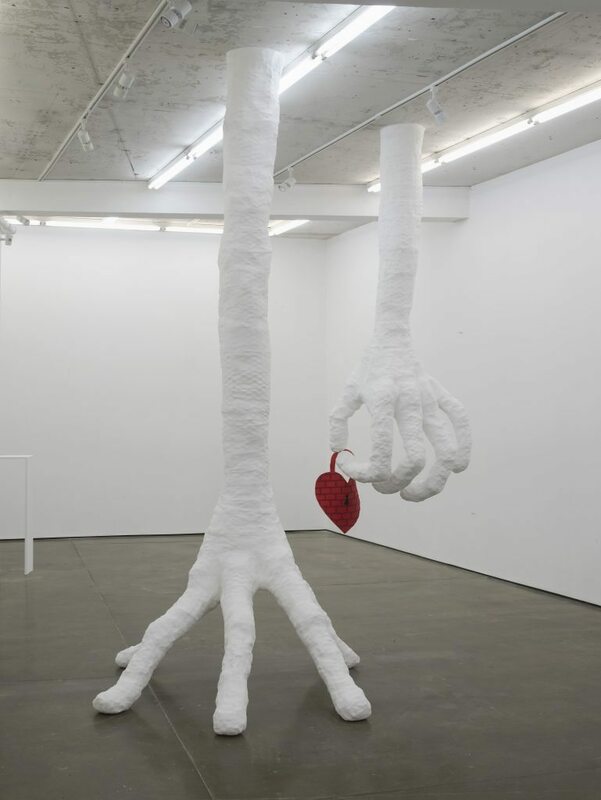 I’m showing three large-scale limb works that drop down from the ceiling or through walls and along the floor, a bit like abandoned parts of a venting system. Intimacy is something I think about a lot in the work -- how close you let someone get to the work and how it’s revealed. I’m interested in creating spaces where scale shifts to create a distancing between the work and the viewer as well as moments that invite a closer look. Since the group show you participated in at Herald Street in London in 2016, you have exhibited drawings alongside your sculptures. How does drawing fit into your overall practice? I started using drawing as a way of making something immediate that isn’t restricted by materials or scale in the same way making sculpture can be. They’ve developed alongside my other works, and I’ve always seen them as equally important, as they both inform and provide a context for some of my other works. The more recent drawings I’ve done feel to me more like paintings and have as much weight as the sculptures I make. I wanted to use the show at Outpost to build relationships between the works on paper and the objects I make. Rebecca Ackroyd (b. 1987, Cheltenham, UK) lives and works in London. She graduated from the Royal Academy Schools in 2015 after completing her BA in Fine Art at Byam Shaw School of Art in 2010. Ackroyd has shown her work at solo exhibitions at OUTPOST, Norwich (2017) and in London at Hunter/Whitfield (2015), Kinman Gallery (2014) and Marsden Woo Gallery (2013). 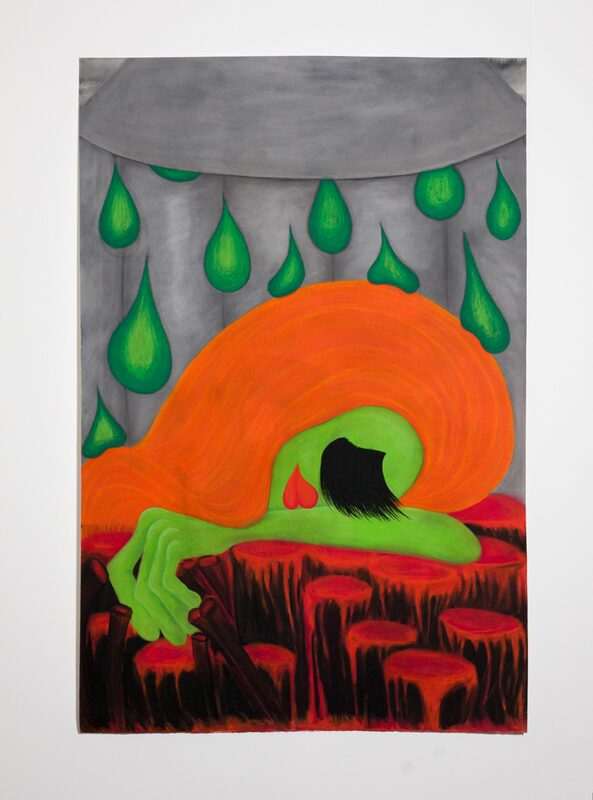 Recent group exhibitions in 2015-7 include: These Rotten Words, Chapter, Cardiff (2017); Walled Gardens in an Insane Eden, Z2O Sara Zanin Gallery, Rome; Modest Villa Immense Versailles (co-curator), Kinman Gallery, London; At Home Salon: Double Acts, Marcelle Joseph Projects, Ascot; Bloody Life, Herald St, London; All Over, Studio Leigh, London; Is it heavy or is it light?, Assembly Point, London; With institutions like these, Averard Hotel, London; Opals, Galerie Opdahl, Stavanger, Norway; Royal Academy Schools Degree Show, London; Works in Residence, David Roberts Art Foundation, London; and The London Open, Whitechapel Gallery, London. In 2013, her work was included in Bloomberg New Contemporaries (ICA, London and Spike Island, Bristol). 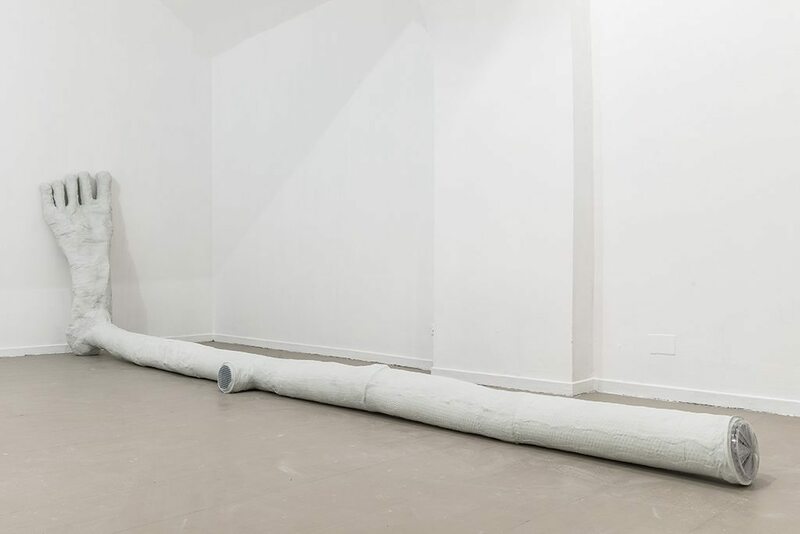 Image 1: Rebecca Ackroyd, installation view of work in Walled Gardens in an Insane Eden, Z2O Sara Zanin Gallery, Rome, 2017. Images 2, 3 and 6: Rebecca Ackroyd, exhibition view of House Fire, OUTPOST, Norwich, 2017. Image 4: Rebecca Ackroyd, exhibition view of Royal Academy Schools Degree Show, London, 2015. Image 5: Rebecca Ackroyd, installation view of work in Bloody Life, Herald St, London, 2016.